I frequently get asked about what I would put into a My Obstacle Course kit to have some basic things to help build basic skills and I definitely have some favorite things and activities that require little if any set up at all. The next few posts will feature some of these. I have lots of basic items or activities that can be turned into thematic activities but they don’t have to be thematic to be fun (if I show them using themed paper, that paper could be substituted for colored index cards). These items/materials are also easy to transport, which makes them perfect to take along on trips for those down times when the kids are hot/cold, electricity is out, it rains or they are just bored and following you around the house saying that they don’t have anything to do. While I love having thematic My Obstacle Courses, there are times when I want to set one up quickly and having these things on hand is super helpful. 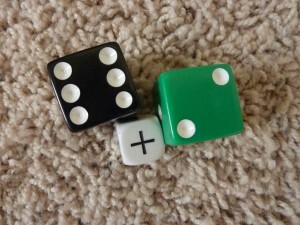 Having a kit prepared allows you to quickly set them out as stations, mix in some gross motor stuff or easy games like Simon Says or Red Light, Green Light and you are engaging with your children, helping them build skills while also having a bit of fun. I will share links to previous posts where I have used these items or activities to give more ideas but remind you to think about what skills your child is ready for or needs reinforcement on and go from there. The things I will share this week can be modified to make them more basic or more challenging and I will note some basic ways to do this. 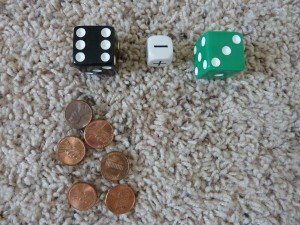 I love to use dice to practice basic math facts. 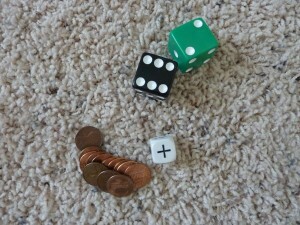 This activity requires only some dice, some pennies to use as counters (if needed) and can be made to work on addition and subtraction by using a die that has the addition and subtraction symbols on it. Add them together to get 11. Subtracting 3 pennies from 6. Something like this is easily stored in a small bag or container, taking up very little space. 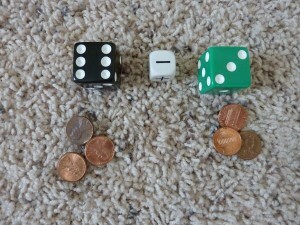 I show 12 pennies here for addition, since both of my dice only go up to 6. 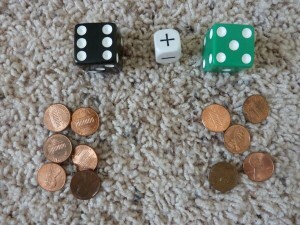 If you have dice with larger numbers, make sure to provide enough pennies by adding together the largest numbers. The same goes for multiplication. 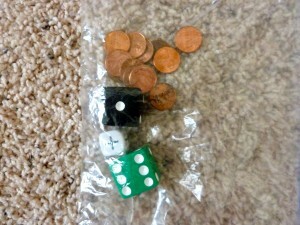 If I were doing that with him, I would provide 36 pennies with these dice. 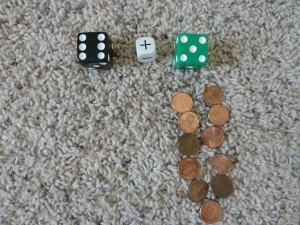 Two colored dice, a die with addition/subtraction symbols and 12 pennies. 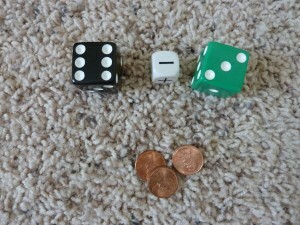 Click here for a previous post on dice.